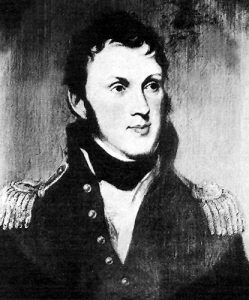 An important expedition was sent up the Missouri River in 1819 under Major Stephen H. Long of the U.S. Topographical Engineers, by order of the War Department for the purpose of thoroughly examining the country, conciliating the Indians and otherwise benefiting the government. A steamboat built near Pittsburgh, Pennsylvania, called the Western Engineer, was well loaded with supplies of provisions and presents for the Indians and dispatched down the Ohio River, reaching the Mississippi River about June 1, 1819. After a few days at St. Louis, Missouri the expedition started up the Missouri River. On July 5th the village of Cote Sans Dessieu was reached, on the 13th Franklin, on the 22nd Chariton, and on August 1st, Fort Osage. There, a detachment under Thomas Say left the boat, and entered what would become the State of Kansas about three miles south of the Kansas River and began to march across the country to the Kanza Indian villages. On August 16th they camped where Topeka now stands, and on the 19th arrived at the Kanza village at the mouth of the Big Blue River near present-day Manhattan. Say’s intention was to visit the Pawnee villages, but being robbed of his horses and camp equipage he was forced to return to the Kanza village, from which point he struck across the country, northeast, and caught the boat near the mouth of Wolf River. On the Western frontier, was an engineer named Major Benjamin O’Fallon, the Indian Agent for the government, on his way up the river to hold peace treaties with the various Indian tribes and punish them for their many misdemeanors of the recent past. On the Missouri River, a short distance above the mouth of the Kansas River was an encampment of white hunters, a number of whom had fled from the vengeance of the law farther to the east. They were little less wild than the Indians themselves and were shunned by the honest trappers. Near Diamond Island, about five miles above the mouth of the Little Platte River was noticed the ruin of an old French fortification or stockade. Below Independence Creek were the old Kanza villages on the west side of the Missouri River. At this place, they found Captain Martin with three companies of riflemen, who had left St. Louis in September 1818, and arrived in October at Isle au Vache, where he had since remained, nearly all the time without provisions, his men subsisting almost wholly on the game which they killed. They were given a plentiful supply of provisions from the boat. It was decided to hold a council here with the various Indian tribes, and accordingly, messengers were sent to their villages inviting them to send delegates to the meeting to be held at Isle au Vache on August 24th. There, came 161 members of the Kanza tribe and 13 of the Osage. They were sharply taken to task for their many offenses against the whites by Major O’Fallon, but they promised in the most abject manner possible, to be “good Indians” ever afterward, and thereupon were given valuable presents of cloth, tools, trinkets, weapons, and ammunition. As the steamboat was short of men Lieutenant Fields and 15 men were taken on here to assist in going up the stream. On September 1st they were near the mouth of Wolf River, and here they were overtaken by the party under Say, which had been driven hack by the Pawnee. 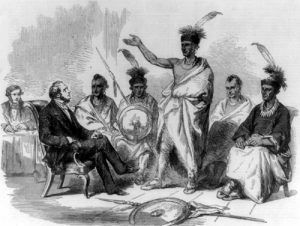 On October 3rd, a council was held with the Otoe and Iowa Indians, all of whom promised submission to the government and were given valuable presents. Then, in succession came councils with the Osage, Kanza, Pawnee Loup, Republican Pawnee, Grand Pawnee, Ponca, Omaha, Sioux, Padouca, Bald Heads, Comanche, Sauk, Fox, and Iowa Indians. The ceremony was usually introduced by the “beggar’s dance,” where all the Indians gathered around a post and in turn advanced and struck it, at the same time recounting their most notable achievements as warriors. 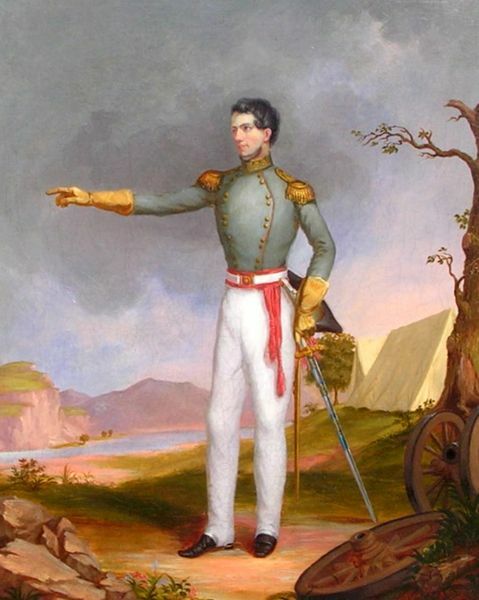 Major Long had returned to Washington in October and the proceedings were conducted by Major O’Fallon. The party wintered near Council Bluffs, Iowa and on June 6th of the following year Major Long, having returned from Washington, sent the boat back to St. Louis and started at the head of a party to explore the valleys of the Platte, Arkansas and Red Rivers. Following the course of the south fork of the Platte River to near its source in the Rocky Mountains, and having pursued his discoveries there as far as his instructions warranted, Major Long separated his command into two divisions, one of 15 men under Captain Bell to descend the Arkansas River, and the other of about ten men under Long himself, to go south to the Red River and descend that stream. Both parties started July 24, 1820, from near Wharf Creek, one of the upper branches of the Arkansas River. Long’s party traveled nearly due south, expecting to reach the upper branches of the Red River before turning to the east, but struck the Canadian fork of the Arkansas River on the 28th, and, mistaking it for a branch of the Red River, descended it until on September 10th the party reached the mouth of the Arkansas River, where for the first time, Long learned of his mistake. After various stirring experiences with Indians, and after suffering severely for want of food, the party under Captain Bell arrived in due time at Fort Smith, Arkansas, where it was joined by that under Major Long, a few days later. An expedition to the village of the Osage Indians was then projected. 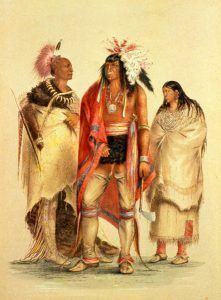 At that time, the Osage tribe was divided into three branches, one on the Verdigris River, another on the Osage River, and a third on the Neosho River. The expedition left on September 21st, and, visiting these bands, arrived in due season at their predetermined destination — St. Genevieve, Missouri. Captain Kearny and two other persons passed by way of Hot Springs, Arkansas. About the Article: The majority of this historic text was published in Kansas: A Cyclopedia of State History, Volume I; edited by Frank W. Blackmar, A.M. Ph. D.; Standard Publishing Company, Chicago, IL 1912. However, the text that appears on this page is not verbatim, as additions, updates, and editing has occurred.